A hidden UNESCO treasure only a few hours out of Lima, Caral is an ancient citadel which predates the Incas by 4,000 years. Time may have forgotten the reputed ‘Oldest City in the New World’ for a while, but it has now rediscovered it with gusto. So come along as we explore what is, thus far, the oldest city ever discovered in the American continent. The mere mention of ‘great ancient civilizations’ is usually enough to conjure up images of grandiose Roman amphitheatres, flamboyant Chinese dynasties, Egyptian pyramids, and awe-inspiring Greek temples. Yet what many people don’t know, is that one of the oldest civilization of modern man arose from the arid desert sands of modern-day Peru. Caral is the incredible legacy the Norte Chico culture left behind: an archaeological masterpiece which was once a bustling metropolis comprising pyramids, temples, houses, amphitheatres, and ornate plazas. In 2001, UNESCO named Caral ‘the oldest city in the Americas’, almost 1,000 years after the first signs of its existence were detected by famed German archaeologist Max Uhle. Not since 1911, when American Hiram Bingham stumbled upon mystical Machu Picchu, has a more significant discovery emerged from Latin America. Finally open to the public and set to become one of Latin America’s foremost historical attraction, the Ancient city of Caral is a marvel not to be missed when visiting Peru. Caral from above. Photo Credit: Ana Paula Bedoya. Caral wasn’t just built 4,000 years before the revered Inca city of Machu Picchu, it was also built four millennia before the great Khmer Empire’s Angkor Wat, three millennia before the Romans built their colossal Colosseum, and even half a millennia before the mighty ancient Egyptians erected their Pyramids at Giza. This ancient city is so old that no pottery has ever been found there. Ceramic had not even been invented when it was built. The mounds which we now know to be pyramids were for decades thought to be natural forming hills by previous surveyors in the early 1900s, and this is primarily the main reason why the city remained hidden for so long. Moreover, when initial carbon-dating was carried out, it was summarily disregarded. Many thought it preposterous that the site could be 4,500 years old. Well, so much for that theory. With further testing, Caral turned out to be 500 years older than that still. Pyramids of Caral. Photo credit: Percy Meza. Yet it isn’t only the age of the structures at Caral that is utterly impressive. What anthropologists find most fascinating are the in-depth stories the city tells of human kind’s first attempts at creating a centralised tiered society, and developing the credo that working together for a common goal is more prosperous in the long run. Caral covers an area of 163 acres and set on a desert plateau in the heart of what is a very lush valley. It seems that it was built very much like a modern-day city, with districts for certain trades and areas set out for the rich and the poor. In total, there are half a dozen flat-top pyramid structures here, built in a circle around a massive plaza. The largest of these is 18 meters tall, with a colossal base that’s 150 x 137 meters. Sacrificial altars and wide staircases are found inside, and it’s widely believed that the rulers at the time lived in dwellings atop the pyramids, from where they could oversee their entire city. The commoners lived in dwellings on the ground, and large sunken plazas prove that elaborate public ceremonies took place. 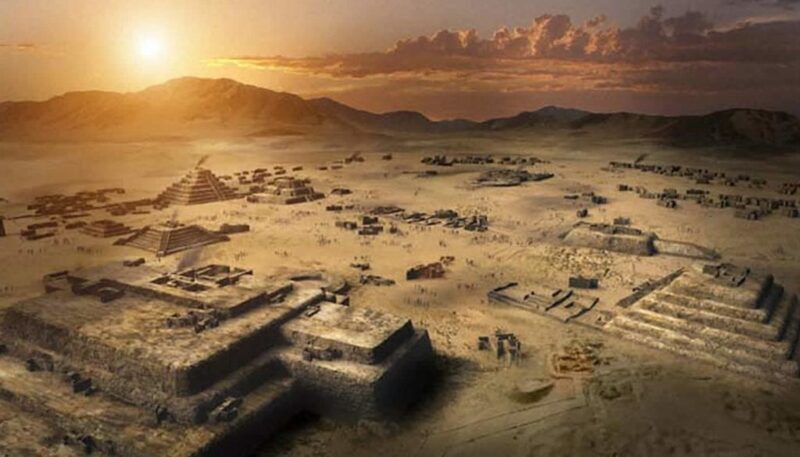 It is still unknown why Caral was abandoned around 2000 BC, although a severe drought is thought to have been the primary reason for mass inland migration. Caral at Sunset. Photo credit: Rodrigo Ramírez C.
The Caral-Supe civilization lived in what is now known as Norte Chico in Peru, an area that stretches along the coast from the centre to the northern tip of the country. Collectively, this ancient culture established at least 30 major settlements. Experts believe there were 3,000 people living here in its glory days, and findings point to them being efficient farmers, boasting a rich and complex socio-political culture. They lived along the arid western coastline, relying on an abundance of anchovies, sardines, guava, squash and beans for survival. Interestingly enough, there has yet to be any sign of them cultivating a cereal or grain of any kind, something of a true anomaly for an ancient civilization. Maze, the revered staple of Latin America, was not farmed until much later. The main non-edible product grown in the region was cotton, which was used not only to make the fishing nets, but also clothing, bags, and ornaments. Cotton farming is thought to have been the main contributor to the rise of inland settlements, which would eventually become much bigger and more prevalent than any seaside ones. The most interesting discoveries at Caral were musical instruments made of animal bones (pelican bones for flutes and llama bones for trumpets) and traces of alcohol and drug production were also unearthed. God or gods worshipping was quite prevalent among the Norte Chico people although who these gods were or what they represented remains a mystery to this day, as does the importance of religion in their culture in general. Speak to the various experts who are dedicating their careers to studying this region, and you’ll find some drastically different opinions. Some believe religion and worshipping were almost a side-note of Caral’s existence, others firmly believe they were the prime impetus for its very construction. One thing is certain, however: the Norte Chico people were anything but primitive. Carvings of monkeys found on their musical instruments hint at their far-reaching roaming, at least as far as the Amazon basin. They built an intricate irrigation system and concocted ancient mathematical instruments called quipu made of alpaca and llama hairs. 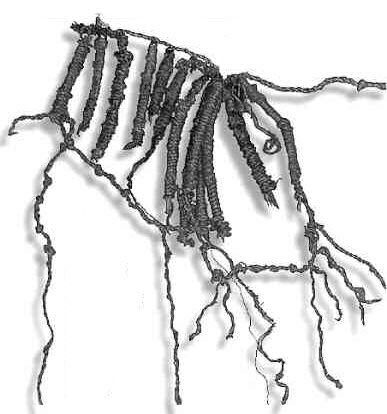 The Norte Chico quipu is thought to be the predecessor to the one fine-tuned and utilized later on by the Incas. As further excavations of Peru’s Supe Valley continue, incredible findings are being reported. More ancient cities, more pyramids, and more plazas are emerging from an area long thought to be unliveable due to the harshness of the land. Caral is one of 20 sites found in an area of the Supe Valley that covers over 80 square km and, astonishingly, one such site seems to predate even Caral by 500 years. Caral is arguably the greatest ancient wonder discovered thus far in South America and possibly the world. And the prospect that more and even older cities may still be hidden in the Supe Valley is simply extraordinary. 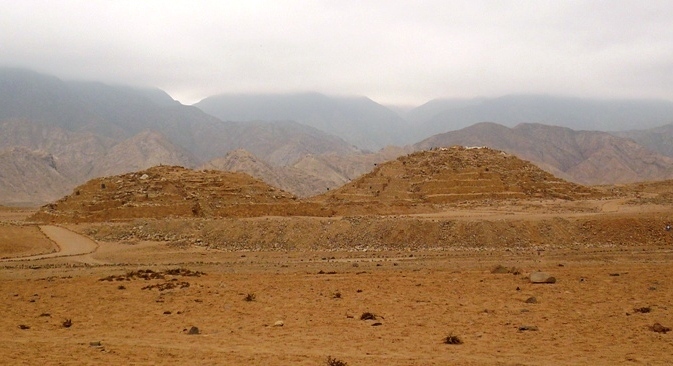 Caral is located only 200km from the city of Lima! 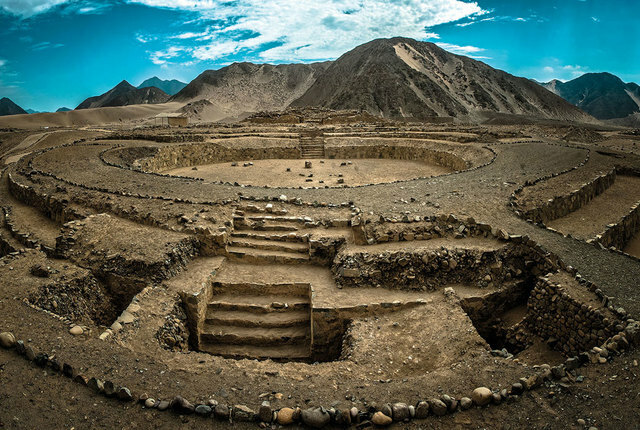 Only 200km from the Peruvian capital of Lima, Caral is now open to the public, with the hope that tourism funds can be channelled into the preservation and further research of the site. The first foreign tourists didn’t arrive here until 2013, so if you’re looking for an off-the-beaten-path attraction of paramount historical importance, dare we say you just found it. If you’re visiting Peru and share our passion for ancient history, you won’t want to miss the chance to visit this outstanding place! So ask us how we can help you add a (long) day trip to Caral on a stopover tour of Lima or, better still, include a visit on a multi-week tour of Peru. 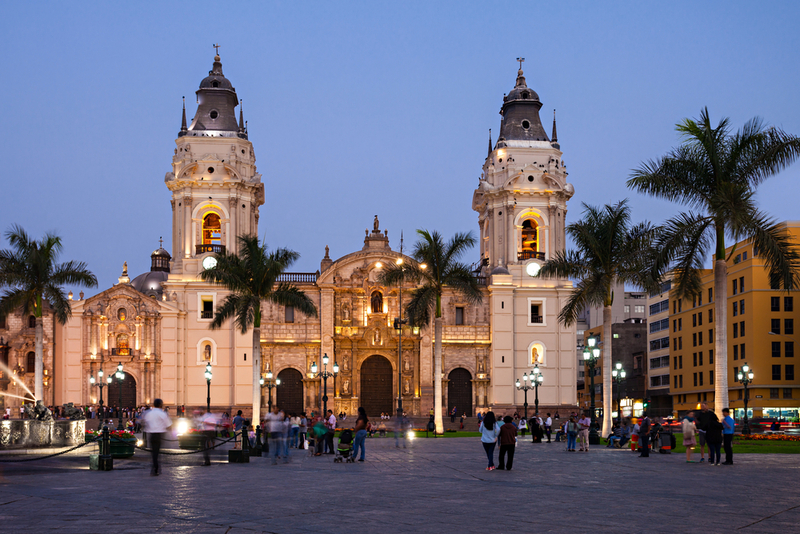 Discover the sites and sounds of colourful Mexico & Peru on this extensive 15-day trip. Explore Machu Picchu, Lake Titicaca, Mexico city & Chichen Itza.